On June 5th 2019 (Danish national holiday) an amazing program awaits you on Lindegaard. This is the first time that all licensed trainers from Denmark gather to show their work. We start with a lecture by Annika Keller about balance, stability and dynamic in horse training.  The German horse therapist, book author and licensed Bent Branderup trainer will explain which aspect she prioritizes in training in oder to support healthy movement patterns under the rider. Annikas lecture is in English. Depending on the audience the main languages used during the evening will be English and Danish. After a break all licensed trainers from Denmark - Maja, Katrine, Maria, Michelle and Kathrin - and Annika from Germany will demonstrate their work with horses and students in the riding arena, so you get get to know all trainers and their focus. Questions are welcome and will be answered after the presentation. 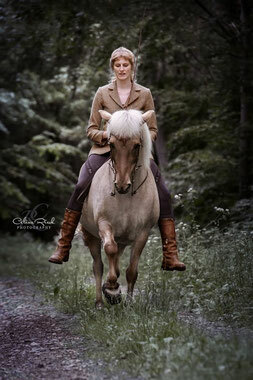 "My Name is Annika Keller and I‘m a passionated rider and riding teacher. I am studying the Academic Art of riding since 21 years now and this journey will never stop in my lifetime. I love to accompany humans and horses on their individual path and put my focus on clear communication and biomechanics of the horse. As a physiotherapist and osteopath for horses, it is very important for me to study and teach, how to train horses in a healthy, motivational physiological way. In my lecture I will speak about the horizontal balance of the horse and how to reach it in the different stages of the education and with different horses." "I'm passionate about horses since I was a child and found my calling in the Academic Art of Riding in 2004. Since then i have worked with many different kind of horses who had special physical or mental needs. During the last years I have focused a lot on the rider and his needs due to crookedness, stiffnesses and how to overcome these, so they could develop a good bodylanguage and balance in the contact with their horse. At the Ladies Night I will show the work with 2 of my horses: Nande, my 15 years old welsh partbred and Deño, my 18 years old PRE. I will show and explain how I educated my horses to carry themselves and me on a lifted healthy back with a long upperline." "Before I got to know the Academic Art of Riding in 2006, I thought about giving up riding, because both me and the horse I had were frustrated. But then I found a way to build up our relationship again and to start a development that was satisfying for both of us. 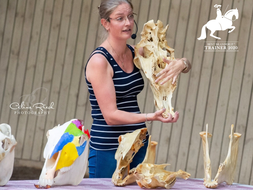 Before I started to be a trainer in the Academic Art of Riding, I was focussed on a career within science and this shaped my approach as a teacher. I'm open and curious about finding new perspectives and aspects in my daily work. When I teach, my role is to help my student find a perspective in his or her experience that is usefull for the current stage of education, for further learning and development. My intention is always that the student learns to use these perspectives for selfresponsible development. During the Ladies Night I will show how I use the focus on a certain perspective when I train my horses Nebo (Welsh Cob, 13) or Indus (Frederiksborger, 12) and when I educate myself." "My name is Michelle Wolf, I have been working with AAR since 2001. I have worked with horses since 1990 which is when we bought Enggaarden – Now Enggaarden School of Academic Art of Riding. Together with my mother Susanne Lanciai and Sandra Larsson, both Upgraded Squires we run a 100% AAR riding school for kids and grownups. What I especially love about AAR is the logical structure and the fact that there is a reason for everything that we do and that that everything we work with is biomechanically and mentally building up the horse. I enjoy that I never stop learning and improving my understanding and thereby improve my skills both as a rider and as a teacher. For me AAR is a never ending, but a continuously developing knowledge, that I love to discover and to share." 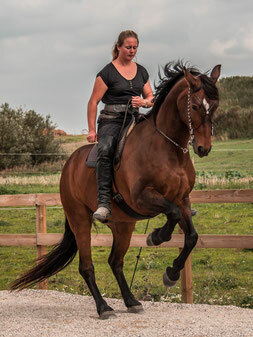 "I am Katrine Buur and I love to explore movement together with horses. Since 2004 “Academic Art of Riding” has been an essential part of these studies. My focus is especially on creating presence and good communication so that movement is fun and educative for horse and human. In my demonstration I will tell you about, how to make a good transition from the secondary aids to the primary aid (the seat) – already from the ground. I will also touch on, how I work with the horse’s motivation and how I find and sustain creativity through the play with movement. It is my thought that my horses will help me to show some examples." "I have been immersed in the Academic Art of Riding for 15 years now. My mission is to expore and to enhance both the horses AND the human bodyawareness, bodylanguage and the joy and competence of movement. I am very passioned about this topic and continuously develop new approaches to teach and to feel the art of riding. In my own training and in my lessons I try to combine the serious, logical and theoretical aspects with te heartwarming, unpretentious and explorative ones. At the Ladies Night I will invite you to follow me on a little journey. In groundwork and longeing my horse and I will show you a few examples of the bodies many ways to communicate and to express themselves. I will also ge the help of a "human horse" to illustrate some of the most common missunderstandings and lacks of clarities that occur between horse and rider and how they can be fixed."